New housing and retail will bring vibrancy to Clifton Corridor. The Atlanta Business Chronicle’s early recognition of the Emory Point development’s merits is a welcome vote of confidence for the work done to date by all the stakeholders in the project. The Atlanta Business Chronicle’s Annual Best in Atlanta Real Estate Awards dinner was held on March 1, 2012, and Emory Point, a mixed-use project between Gables Residential and Cousins Properties, was awarded Best in Atlanta in the mixed-use category. Emory Point, a more than $100 million mixed-use project on Clifton Road, was noted as being the largest private development to start inside the Perimeter since the commercial real estate crash began in 2008. The project was noted for the rising demand of apartment living, the most favored type of development because the supply of apartment units has dwindled during the economic downturn. The project was also commended for the retail and restaurants that will be near the Emory University campus and the Centers for Disease Control and Prevention – a huge employment center that has immediate access to relatively few amenities. Emory Point’s apartment homes already have a priority waiting list of more than 500 people. Nearly a dozen retailers have signed leases, including CVS Pharmacy and eateries like Marlow’s Tavern, Tin Lizzy’s and newcomer to the States, La Tagliatella. The retail portion of the project is expected to create more than 1,000 direct and indirect jobs. The project originated from a 2005 initiative launched by Emory called the Clifton Community Partnership that was aimed at improving the quality of life in and around the Emory campus, reducing single occupancy vehicle traffic in the Clifton corridor and creating additional housing opportunities. Cousins selected Gables Residential as a partner to develop Phase I of Emory Point. Originally scheduled to break ground in 2008, plans were put on hold due to the recession. Plans were reignited in 2010, as Cousins and Gables adjusted the business plan to meet market demands. Instead of a mix of apartments and condos, they would build apartments and retail. 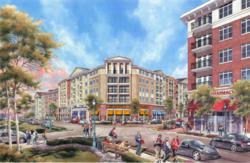 Phase I will feature 443 luxury apartment homes and more than 80,000 square feet of retail space. It is currently on track to deliver summer, 2012. Pre-leasing, which will include previewing floor plans, pricing and selecting apartment homes will begin in April. For more information call (866) 312-4782 to speak with a leasing associate or to schedule an appointment. Or visit http://www.gables.com/emorypoint. With a mission of Taking Care of the Way People Live, Gables Residential has received national recognition for excellence in the management, development, acquisition and construction of luxury multi-family communities in high job growth markets. Gables Residential owns, develops and manages multi-family communities and mixed-use developments in Atlanta, Austin, Dallas, Houston, South Florida, Southern California, and metropolitan Washington, D.C. Additionally, it has third-party management operations in the Chicago, New York, Boston, Phoenix, Central and North Florida, and Washington State markets. Gables Residential enjoys a healthy portfolio with approximately 37,000 apartment homes under management, including a corporate-owned portfolio of 55 stabilized communities comprising approximately 14,400 apartment homes. An additional 7 communities are under development/lease-up, comprising approximately 2,000 apartment homes. Gables also has the ability to develop another 2,000 apartment homes through its shadow pipeline of undeveloped land owned. For more information please visit http://www.gables.com.